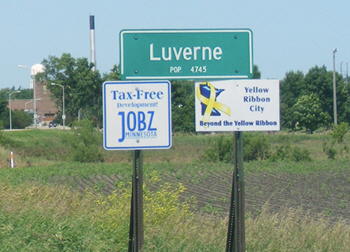 Luverne is a city in Rock County, Minnesota, along the Rock River. 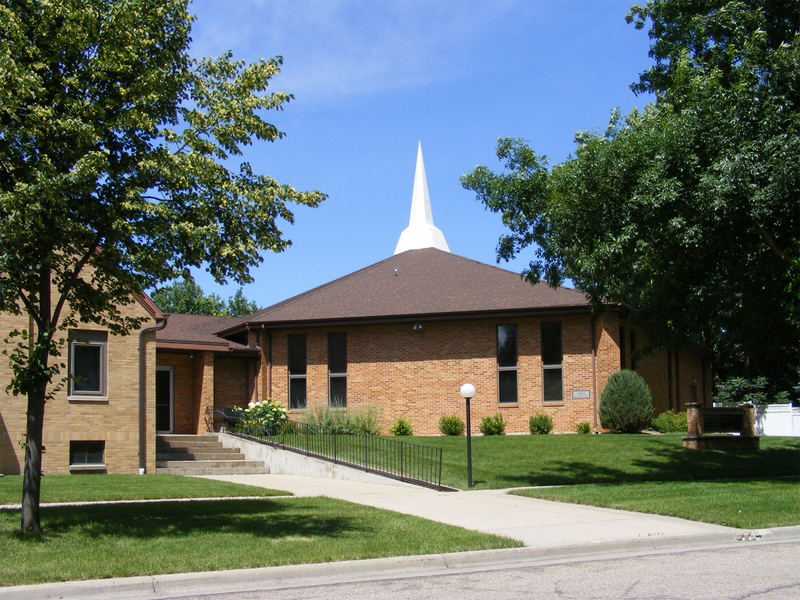 It is the county seat of Rock County. 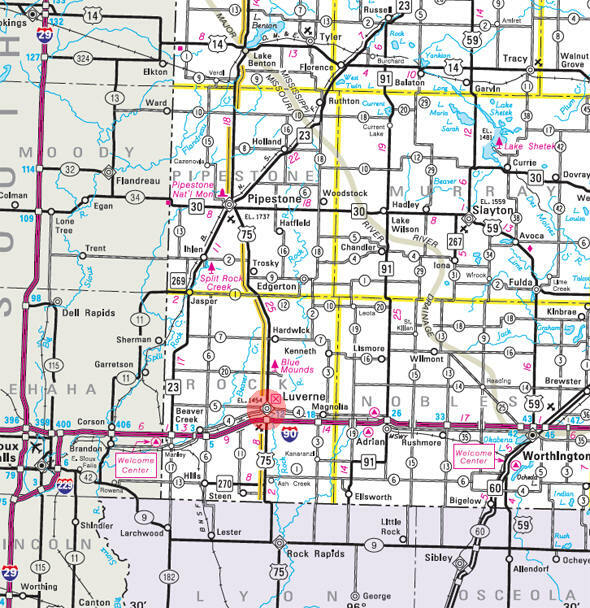 Interstate 90 and U.S. Route 75 are two of the main routes in the city. 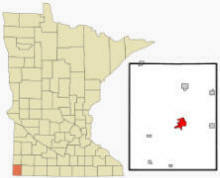 According to the United States Census Bureau, the city has a total area of 3.69 square miles (9.56 km²), of which, 3.69 square miles (9.560 km²) of it is land and 0.01 square miles is water. The elevation is 1,467 ft (447 m) above sea level. As of the census of 2010, there were 4,745 people, 2,048 households, and 1,257 families residing in the city. The population density was 1,289.4 inhabitants per square mile (497.8/km2). There were 2,237 housing units at an average density of 607.9 per square mile (234.7/km2). The racial makeup of the city was 96.3% White, 0.8% African American, 0.2% Native American, 0.6% Asian, 0.4% from other races, and 1.6% from two or more races. Hispanic or Latino of any race were 2.7% of the population. There were 2,048 households of which 27.7% had children under the age of 18 living with them, 49.0% were married couples living together, 9.1% had a female householder with no husband present, 3.3% had a male householder with no wife present, and 38.6% were non-families. 35.8% of all households were made up of individuals and 19% had someone living alone who was 65 years of age or older. The average household size was 2.23 and the average family size was 2.89. The median age in the city was 42.1 years. 24.4% of residents were under the age of 18; 6.4% were between the ages of 18 and 24; 22% were from 25 to 44; 24.3% were from 45 to 64; and 23% were 65 years of age or older. The gender makeup of the city was 46.8% male and 53.2% female. LUVERNE, a city in Luverne Township and the county seat, first settled in 1867-68, platted as a village in 1870, was incorporated by a legislative act February 14, 1877, and by vote of its people November 12, 1878. 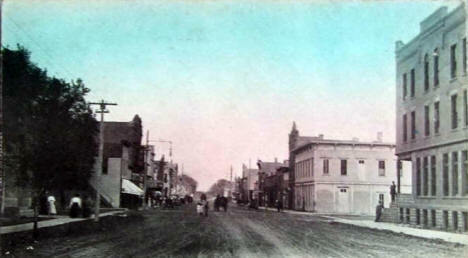 Nearly 26 years later, on September 7, 1904, it was organized as a city. This name was adopted for the post office begun in the winter of 1868, being in honor of Eva Luverne Hawes, the eldest daughter of the first settler here, Philo Hawes; Hawes's step-brother, Edward McKenzie, was postmaster. She was born at Cannon Falls in Goodhue County, November 14, 1857; accompanied her parents to the Rock River home in 1868; was married to P. F. Kelley, September 5, 1876; and died in Luverne, June 9, 1881. In the early years the name was spelled as two words, Lu Verne, "but the style was gradually replaced by the present form." The personal name was found in a novel or romance, then probably a new book or published in a magazine, which was read by Philo Hawes's cousin Lucy Cotter, of Red Wing, at whose request the baby Luverne was so named. 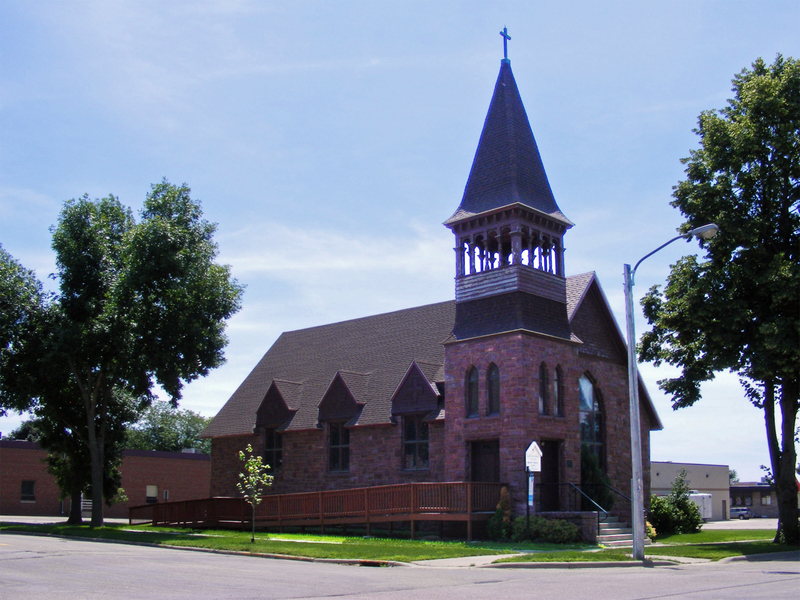 As her father and mother are also honored by the name of the village and city, this notice may desirably add that he was born in Danby, N.Y., December 18, 1830, and died at Luverne, August 10, 1908. He came to Minnesota in 1853; served as second lieutenant in the Eleventh Minnesota Regiment in the Civil War; was a mail carrier in 1867 between Blue Earth, Minn., and Yankton, Dakota Territory; settled on the site of Luverne in March 1868; was chairman of the board of county commissioners, 1871-73; was postmaster of Luverne, 1871-74 and 1888-93; and engaged in real estate and insurance business. 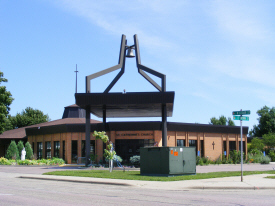 The Brandenburg Gallery, which opened in May 1999, is owned and operated by the Luverne Area Chamber of Commerce. The gallery contains the breath-taking photos taken by Jim Brandenburg, an internationally known nature photographer and a Luverne native. The gallery features many of the artist’s more popular prints, but the overall theme focuses on the prairie. The gallery also sells Brandenburg materials, prints, books, and artifacts. In addition to the photos on display and available for purchase, there is also a video area where visitors can enjoy the videos made by Brandenburg and about him. 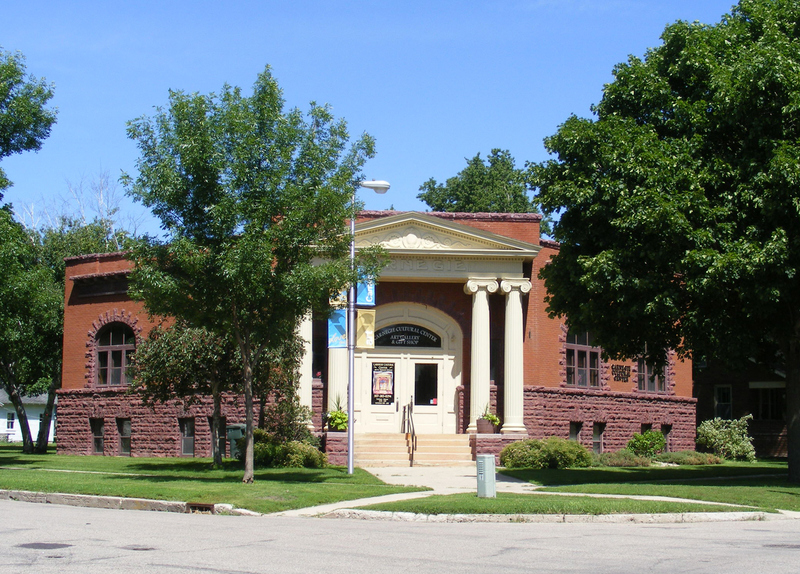 The Carnegie Cultural Center celebrated its official opening during the Buffalo Days Celebration in June of 1992 and presently hold the Cultural Center. 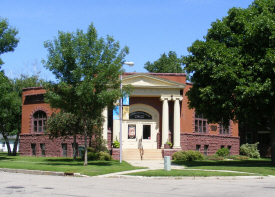 The Carnegie Cultural Center was previously used as the Rock County Community Library until volunteers completed renovations to change the facility into the Cultural Center it is today. With new exhibits each month, the center also showcases the artwork of Luverne students. 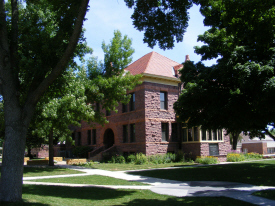 Also located in the center is the Carnegie Gift Gallery. The Gift Gallery offers music, woodcarvings, books, prints, jewelry, and original art by local artist, authors and musicians. In 1892 Mr. R.B Hinkly, then the Mayor of Luverne, built a beautiful home for himself and his family. 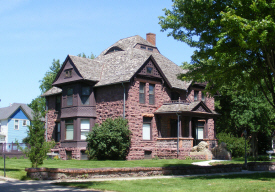 The house was constructed of Sioux Quartzite quarried and hauled on horse-drawn boats from the Blue Mound Quarry north of Luverne. 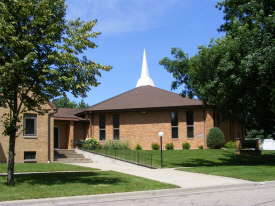 In April of 1959, the home was donated to the Rock County Historical Society and opened as a museum in August of the same year. The Hinkly House was placed on the Register of the National Historic Sites on June 10, 1975. Within the last ten years, great efforts have been made towards the restoration of the museum. 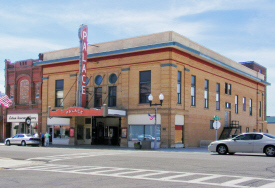 The Palace Theatre was constructed in 1915 by architect W.E.E Greene. The Palace, a 550-seat theater first owned by Herman and Maude Jochims, was built primarily for the presentation of stage plays by traveling theater troupes and for the "moving pictures," then an upcoming form of entertainment. 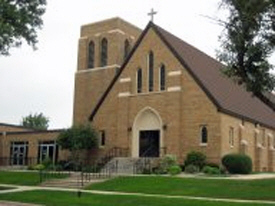 Its focal points include the originally painted wall panels, stage curtains, the artistic wall and ceiling decor, and the pipe organ. The Geneva console pipe organ was installed in 1926 to provide accompanying music for the silent movies. The organ has recently been restored and is in the the Palace Theatre today as the oldest working theater organ of its make and model in the United States. In 2016, The Rock County Historical Society acquired and renovated the Herman Motors Building located at 312 E Main. They opened the doors to the Rock County History Center in October 2016. On display are 2,500 nutcrackers, photographs, tools, documents, and articles from old newspapers, and county records. Actual furnishings from the courthouse, law enforcement, rural schools, and professional offices are on display. You can visit the History Center Tuesday through Saturday between 10:00 a.m. and 4:00 p.m. or by appointment. In July 2009 the old Rock County Jail and Sheriff's Residence officially opened following a $4 million renovation as a place of community, history, and art. Two floors feature the award-winning photographs of National Geographic nature photographer and Luverne native, Jim Brandenburg. On the fourth floor the Heritage Gallery tells the story of the families who served on the Home Front during WWII. Their stories provide pivotal tales of the sacrifice of men, women and children who were left home when their sons, daughters, fathers, and mothers went off to war. 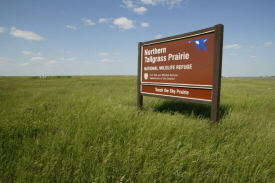 The Brandenburg Prairie Foundation and the U.S. 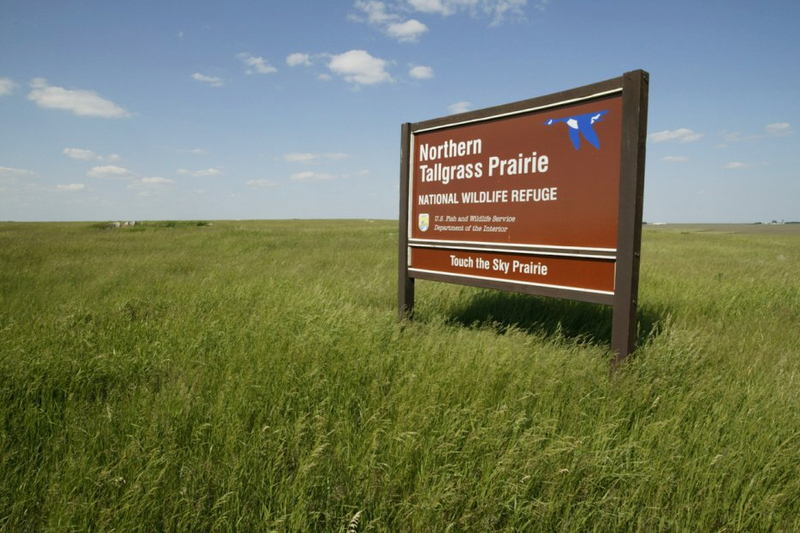 Fish and Wildlife Service have purchased over 800 acres of untilled prairie land in Rock County, Minnesota, now known as the "Touch the Sky Northern Tallgrass Prairie National Wildlife Refuge." 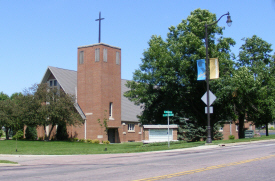 Together, they have developed a 15-year management plan for its restoration. With time and continued effort, hundreds of native species will return--the songbirds, flora and native wildlife. The dream is to see the bison roaming "Touch the Sky Prairie" again. 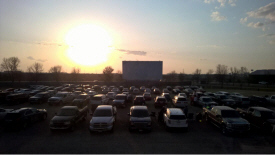 The Verne Drive-In Theater was built in the 1950's by Kenneth and Maude Sargent and was sold to the Walt Deutsch family that operated it until 1988. The buildings were originally constructed of top and underground circuits systems of 8,000 feet of wires that were stretched throughout the theater to link autos with sound and picture. The first movies had an admission price of 60 cents with children under age 12 admitted free. The paved trail starts on Blue Mound Avenue and continues north going out of town, wrapping around the Blue Mounds State Park and the Quarry. This very scenic trail has a distance of approximately 6 miles and is a great spot for biking, skating, jogging or walking. 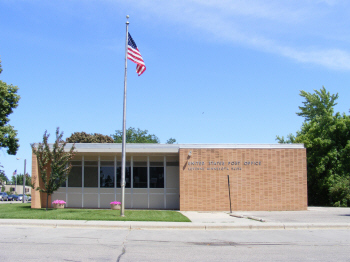 The Luverne Hockey Club completed an ice arena in fall of 1991. 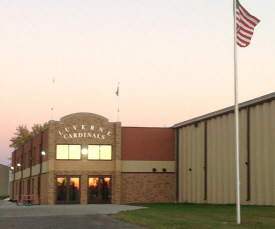 The $800,000 project was partially funded by donations and fund-raisers sponsored by the Luverne Hockey Club. Throughout the winter months the ice arena is used for Luverne Cardinal hockey games, open skating, ice skating lessons, and other special activities. 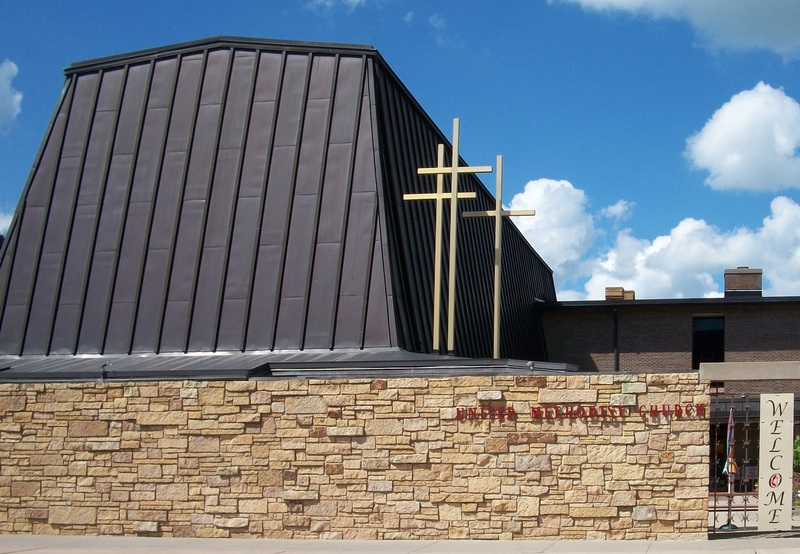 In the summer, the building is used for off-ice hockey camps and a variety of other events. 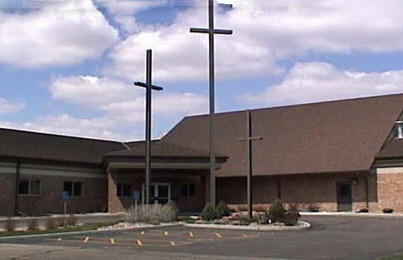 The building can also be rented for a variety of activities. 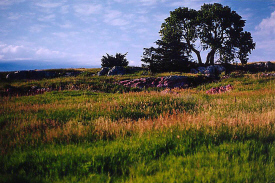 Blue Mounds State Park is located 4 miles north of Luverne on Highway 75 and 1 mile east on County Road 20. Blue Mounds State Park is full of natural surprises! Start with the Sioux quartzite cliff, rising 100 feet from the plains. A bison herd grazes on the prairie. Prickly pear cacti bloom in June and July. A sea of prairie grasses and flowers sway in the wind. The park is also a favorite for birdwatchers who want to see nesting blue grosbeaks and other birds. Enjoy camping, hiking, climbing, biking, as well as the unique sights and wonderful aromas of a beautiful prairie. 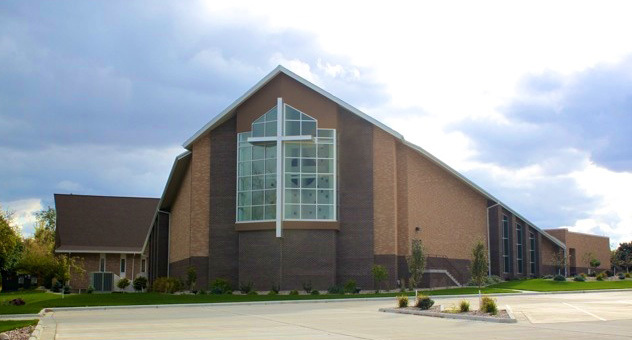 The City of Luverne provides the community with this state-of-the-art recreation facility. 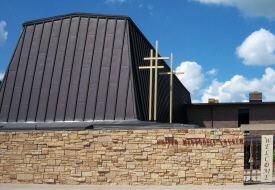 The pool and fitness center is open seven days a week and can be rented for special events by reservations. 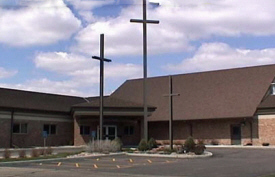 The center contains an Olympic size pool, large wading pool, and hot tub. The fitness area has the latest in exercise equipment and a complete weight room. 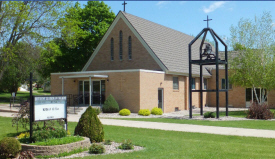 There are annual membership fees as well as monthly fees for the pool, fitness center or both. The Luverne City Park is located on 19 acres at the east end of Main Street. The beautiful wooded area boasts several playground areas with new, brightly colored equipment, an enclosed shelter with water and electricity, 2 open picnic shelters, a softball diamond, volleyball courts, a full basketball court, and horseshoe pits. Picnic tables and grills are located throughout the park, and a full restroom facility is centrally located. 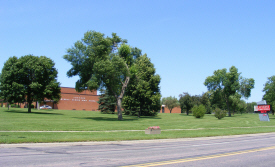 Tennis courts, a skate park, and Redbird field (the City of Luverne's premier ball diamond facility) are located on the west end of the City Park and across the Rock River. 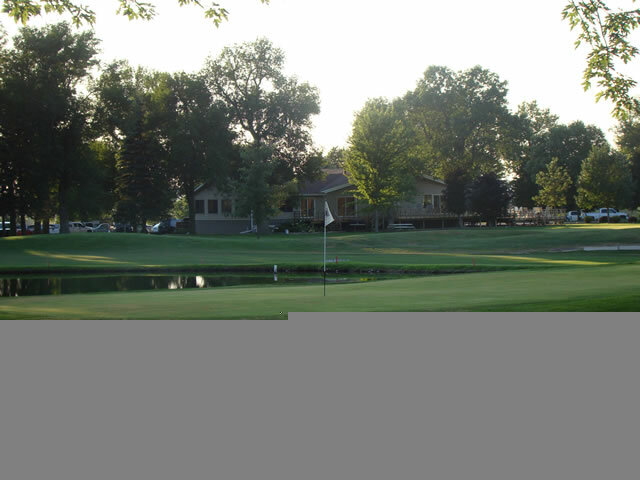 The Luverne Country Club is a semi-private course located two miles east and one mile south of Luverne. 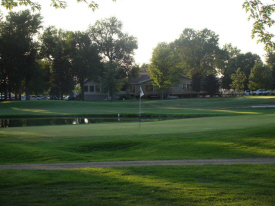 LCC is a Par 36 course with green fairways, abundant trees, a driving range, and water hazards all set in a beautiful location overlooking Luverne. Come for a round or join a league. 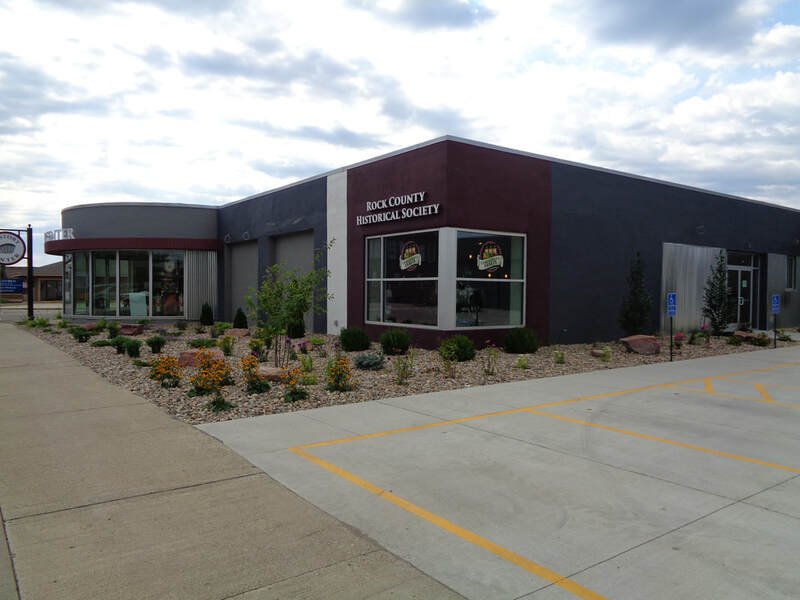 The Rock County Sportsman's Club offers handicap trap league, 16 yd trap league, 25 yd trap league, doubles trap league, and member/non member trap practice on Tuesday nights from 6 p.m. to 11 p.m. The club and league open at the end of April through early September. You DO NOT need to be a member to come out and shoot practice rounds. If you don't have 5 friends to fill a league team, come out to the club and we will find you a team to shoot on. 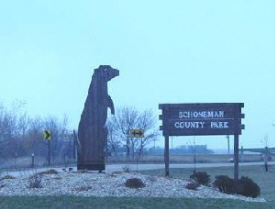 In addition to the beautiful parks within the city, just south of Luverne on Highway 75, you will find Schoneman County Park. 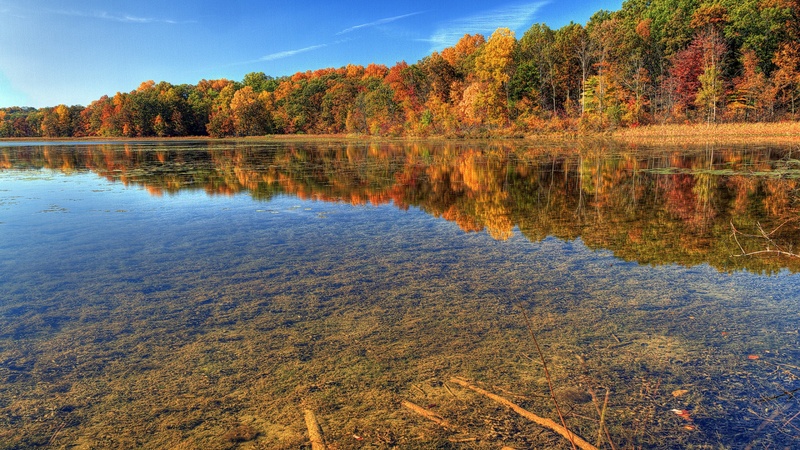 There are picnic areas, fishing, and nature walks around this area. Recently the park has become home to a large flock of Canadian geese that return annually to the area to nest. 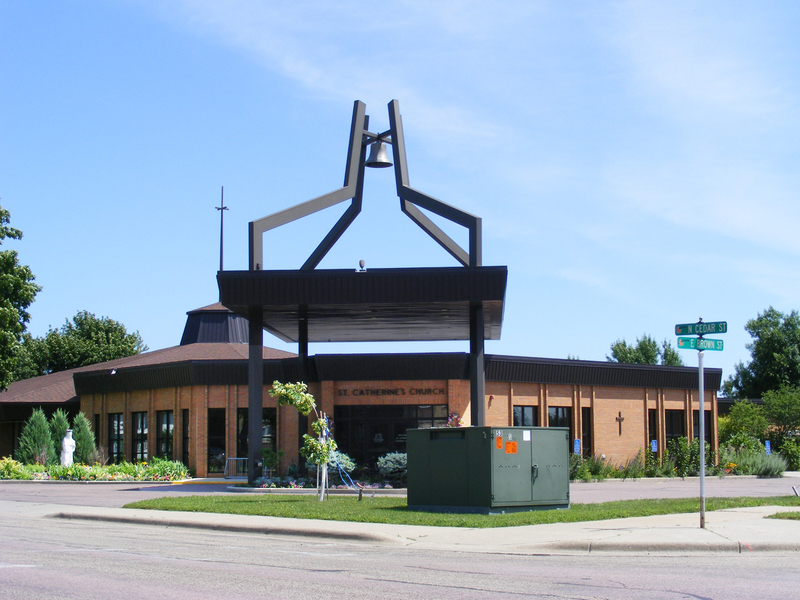 Sanford Luverne Clinic is a primary care clinic with locations in Luverne, Adrian and Edgerton. 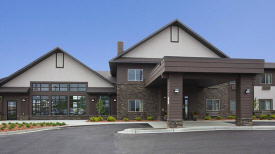 Sanford Luverne's Family Medicine clinics provide care for the whole family - from babies to grandparents. We get to know you and your family and treat a variety of illnesses and injuries as part of your medical home. From annual physicals, regular check-ups, baby wellness, vaccinations, school and athletic physicals our family medicine providers serve families and communities throughout the region with the latest in care. As part of the Sanford Health system, Sanford Luverne Clinic also provides on-site access to pediatric and adult outreach specialists. 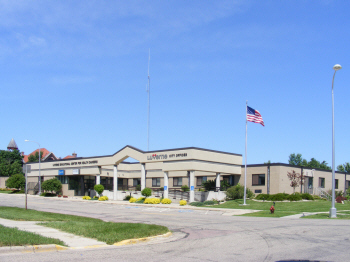 Sanford Luverne Medical Center is located in the southwest corner of Minnesota, in the progressive city of Luverne. 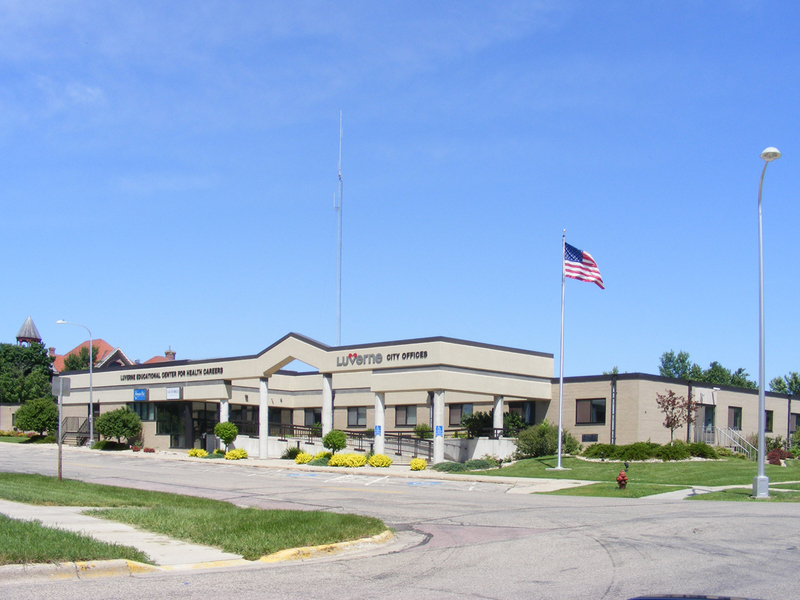 We provide healthcare close to home by offering quality general and specialty services in a caring, compassionate environment. Our mission, "Dedicated to the Work of Health and Healing," is an evident goal of the professional staff who strive to provide exceptional care to all they serve. 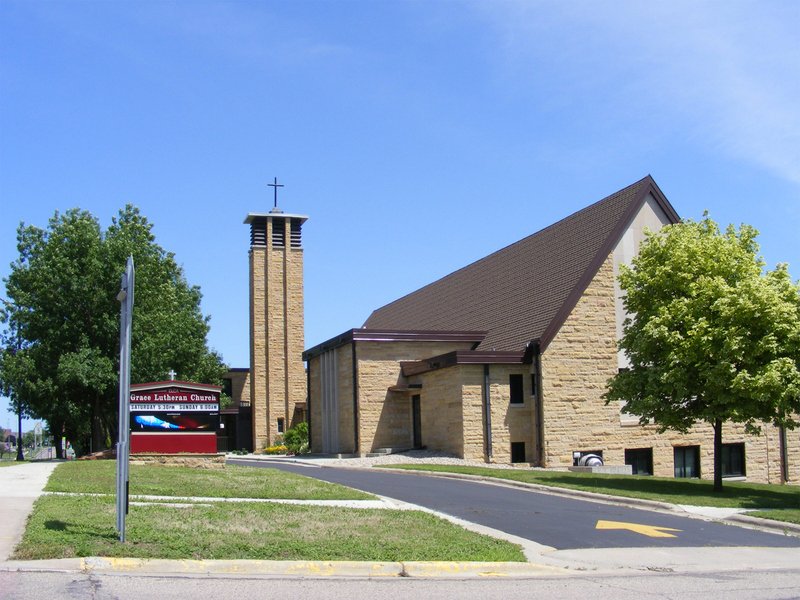 GrandStay Hotel & Suites is the perfect choice for anyone looking for hotels in Luverne, MN. 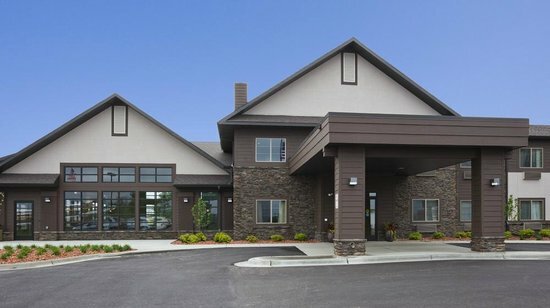 Winner of Trip Advisor's 2017 Certificate of Excellence, this beautiful, new hotel near Rock Rapids, IA and Adrian, MN has a range of modern accommodations and amenities ideal for leisure and business trips. Guests can upgrade to a relaxing whirlpool king suite or affordable one-bedroom suite with a fully equipped kitchen, which is great for families and extended stays. 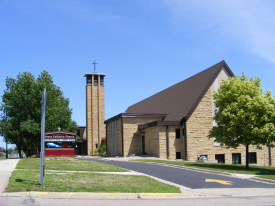 Our convenient location makes it easy to explore many attractions in the area, including the spectacular scenery of Blue Mounds State Park and numerous outdoor recreation opportunities. 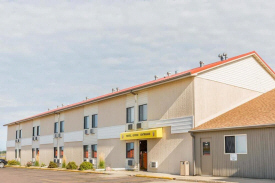 With value and convenience you can rely on, our Super 8 Luverne hotel near Blue Mound State Park offers quick access to I-90. 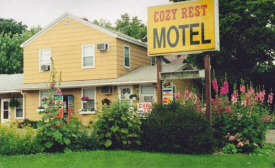 Our ideal location was designed with your comfort in mind, and we feature thoughtful amenities to brighten your stay. 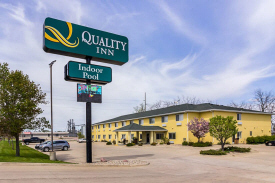 The Quality Inn® hotel in Luverne near Blue Mounds State Park lets you relax and focus on the people and experiences you came for. Conveniently located north of Interstate 90 in southwest Minnesota, this pet-friendly hotel in Luverne is near other local sites, activities and attractions like: Rock County Historical Society Hinkly House Museum Maplewood Chapel Our Value Qs deliver professional, responsive and friendly service, as well as amenities that give you more for your hard-earned money such as an indoor pool, guest laundry facilities, a hot tub and copy, print and fax machines. 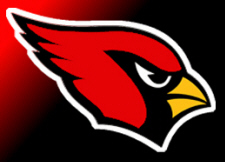 Luverne Business Directory is coming soon!